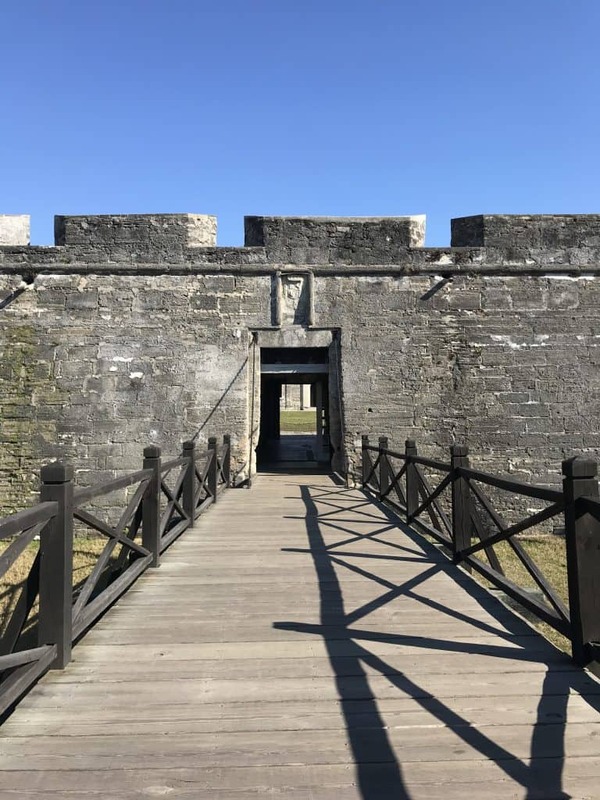 A mini travel guide to the oldest city in the U.S., with recommendations for where to eat, where to stay, and things to do in St. Augustine, Florida (especially if you’re a foodie and history lover!). I just got back from a mother-daughter trip to St. Augustine, Florida. It was my first time there and I absolutely loved it! 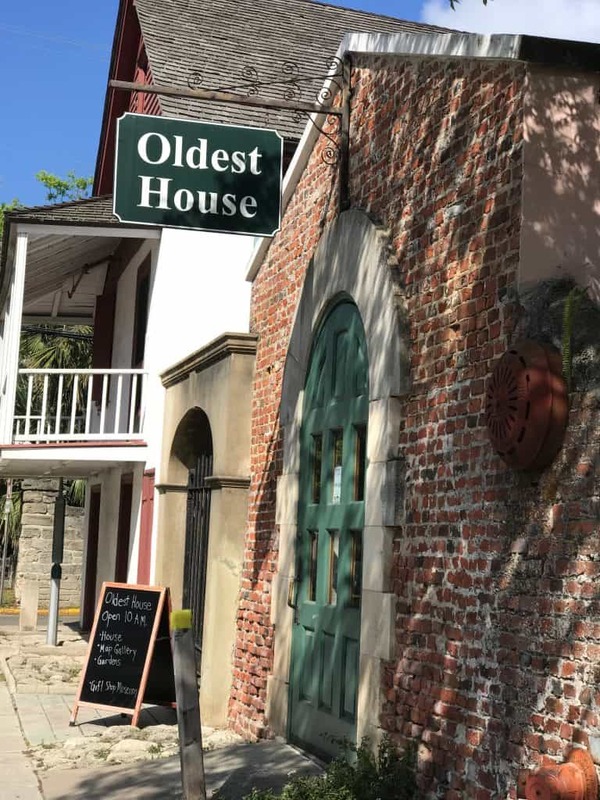 As our nation’s oldest city, St. Augustine has so much to offer — history, culture, beaches, great food, nature, an abundance of cozy inns and B&B’s, and ghosts! It’s only an hour and a half away from where I live in Orlando, and I can’t believe this was my first time visiting St. Augustine after living here for almost a year! My mom and I spent four terrific days in beautiful St. Augustine. We chose it partly because of its close proximity and mainly because of all the history there — we love history! If you’re thinking of visiting the nation’s oldest city (and you totally should! 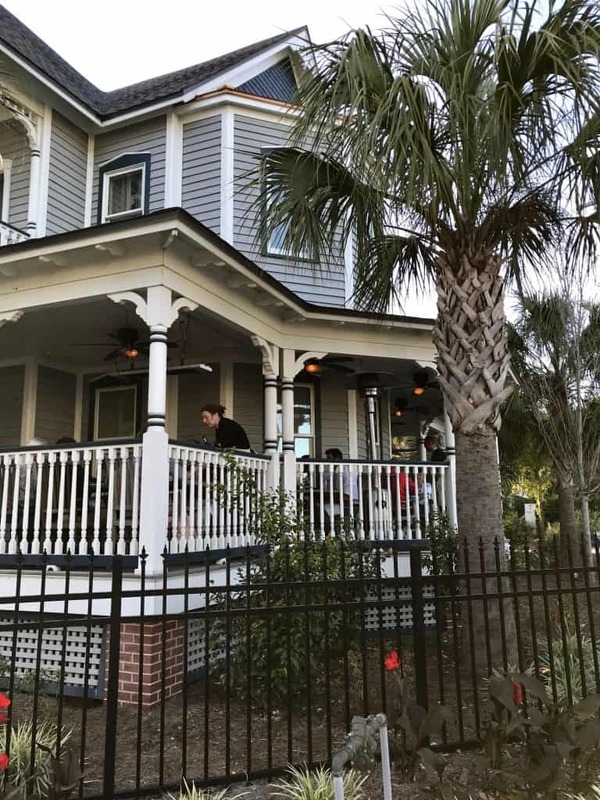 ), read on for detailed reviews and recommendations of where to stay, where to eat, places to see, and things to do in St. Augustine, Florida. I can tell you there are no shortage of inns for your visit to St. Augustine. 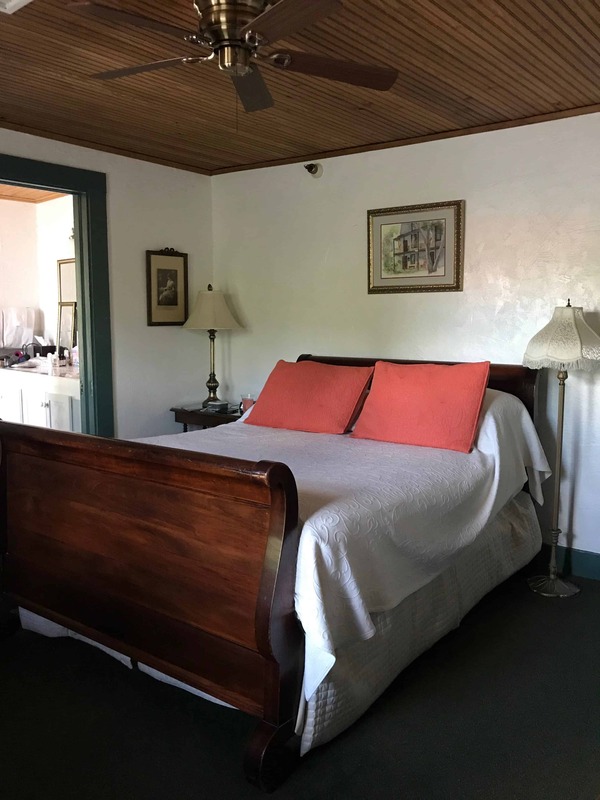 After poring over travel guides and reviews for DAYS, and deliberating to the point of making ourselves crazy (because that’s how we roll), we decided on the St. Francis Inn. 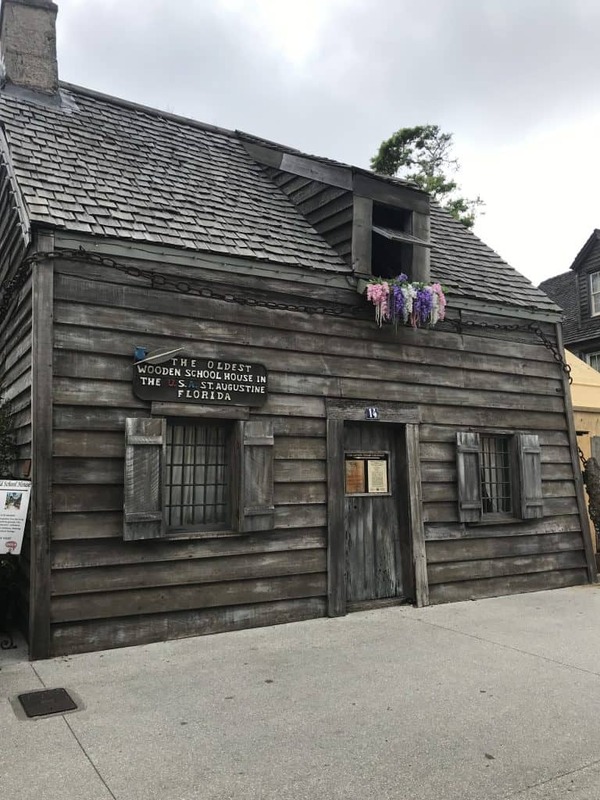 There were several inns in the running, but since exploring the history of St. Augustine was the focal point of our trip, we went with the St. Francis because it’s the oldest inn in the city! It’s also within walking distance of Old Town, the most historic area of St. Augustine. Plus, it’s a member of Select Registry, so we knew they would adhere to high standards. The St. Francis Inn was built in 1791 as a residence, so it’s over 200 years old. In addition to this main building, the inn includes a beautiful old house across the street called the Wilson House, which seems to have been built in the late 1800’s. Besides the history, another selling point was all the extra amenities they offer, like a full breakfast (which was delicious); a social hour with wine, beer, and homemade refreshments; a fresh homemade dessert every night; a firepit in the courtyard and all the fixings for s’mores each night; coffee and a selection of hot and iced teas available throughout the day; complimentary beach access that includes beach chairs, towels, cold water and a full bath/shower; and complimentary passes and discounts to a variety of local sights (which saved us a nice little chunk of change!). There are rooms available in a variety of sizes and price ranges. 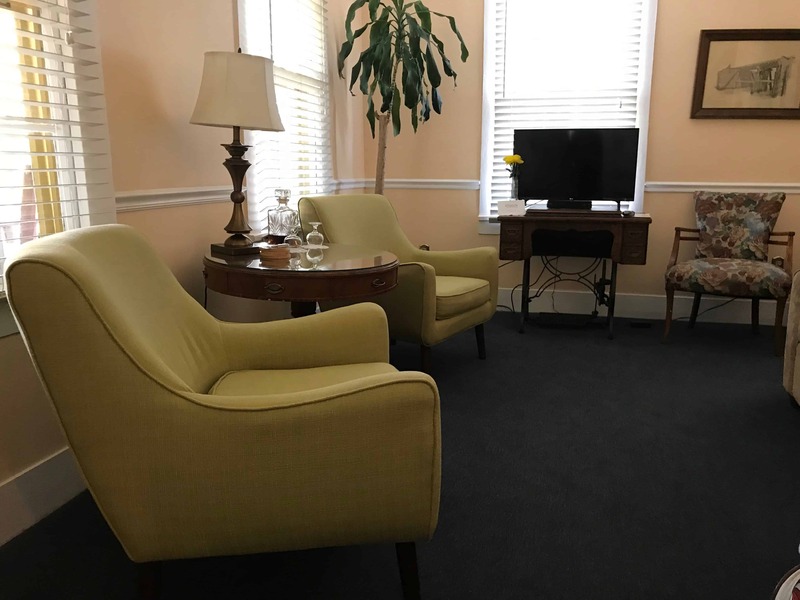 We wanted to stay in the original building, and also keep to some semblance of a budget, so we opted for one of the lower-priced rooms in the original building called the Dummett Room (named for one of the former owners). The room was, of course, one of the smaller rooms. 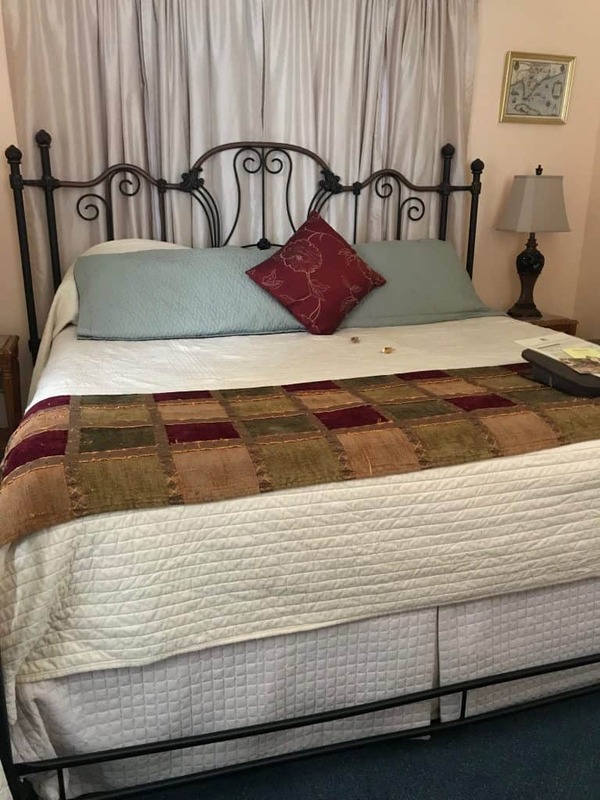 It had a queen size bed and a surprisingly large bathroom that was nice and bright (perfect for two women sharing a room!). We ended up only in this room one night. Due to a little plumbing problem in our room, we were moved to a different room in the Wilson House across the street. The staff were great about quickly making other arrangements for us, and even upgraded us to a larger room. It was cool because we got to experience both the main inn and the Wilson House. Our room in the Wilson House, the Wilson Suite, was beautiful and spacious with a separate sitting room and our own private balcony. We loved having our own little balcony nestled up in the trees to enjoy coffee and tea in the morning and a glass of wine in the afternoon. Many of the rooms at the inn offer private balconies (all of the Wilson House rooms have them), as well as fireplaces. Both rooms were comfortable and each had its own feel. The Dummett Room was cozy, quiet, and peaceful. The Wilson Suite was much larger (though the bathroom in this room was smaller) and brighter with lots of windows to let in the sunshine. I noticed a bit more street noise in this room than the Dummett Room in the main inn, but it wasn’t bad at all. The beds in both rooms were very comfortable, but the pillows not so much — I recommend bringing your own if possible. All those hours of lodging research paid off, because we were very happy with our decision to stay at The St. Francis Inn. It’s a lovely property and we thoroughly enjoyed our stay there. The rooms were attractive and comfortable, the grounds were gorgeous and beautifully landscaped, the refreshments were delicious, and the staff were very nice and helpful. I also loved all the nice little extra touches, like providing a lap desk in each room so you can easily use a laptop or tablet in the bed — something I do all the time! They even have a resident cat! Her name is Rebel and she stays outside on the property. The inn is also within walking distance of the historic Old Town area, and they have off-street parking available (which is worth its weight in gold there!). 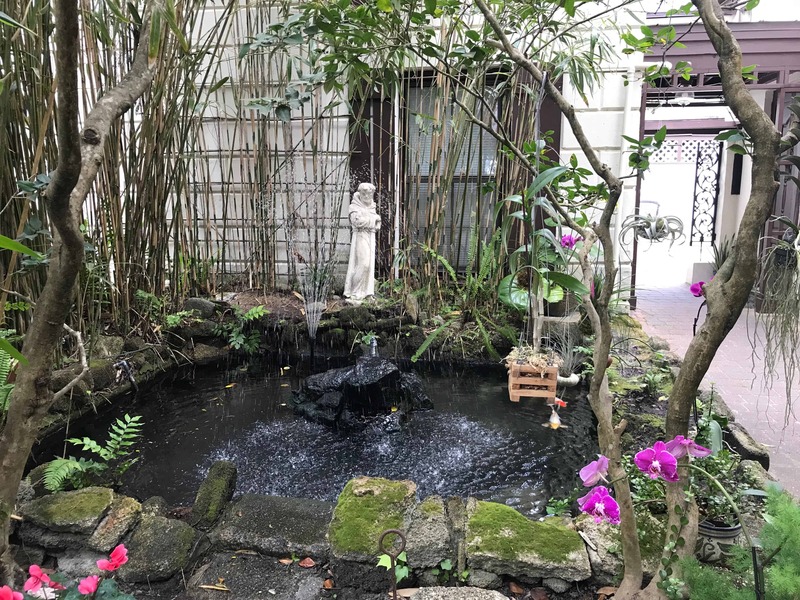 In my experience at the St. Francis Inn, they really go above and beyond to make your entire experience enjoyable, making it so much more than just a place to stay. I highly recommend it! We were all about the history on this trip, so almost all of our activities and sightseeing revolved around the history of St. Augustine. 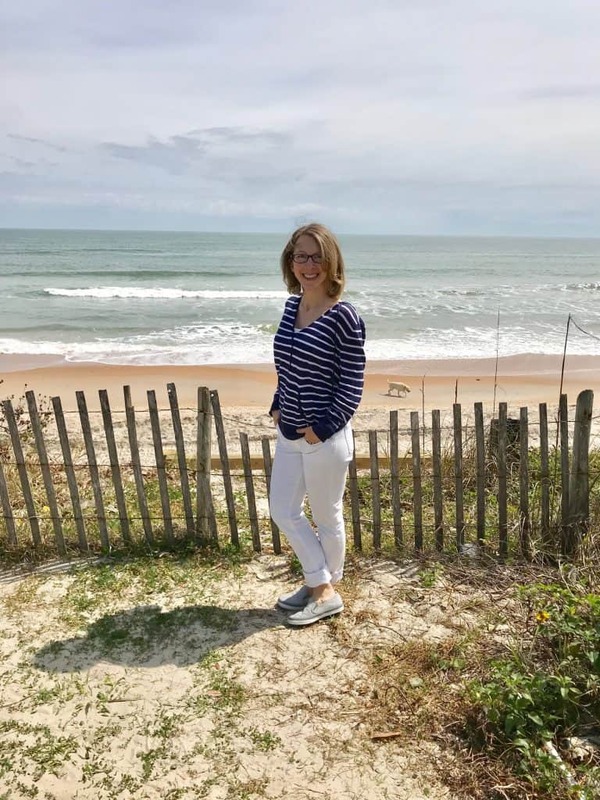 Just know that it’s right on the beach so if you don’t want to just do history, you have the option of spending time at the beach, too, as well as lots of opportunities for nature lovers. This may be touristy, but it’s a great way to get around the city, learn more about the history, and see the sights. Plus it’ll really help you get your bearings, so I recommend doing it your first day there if possible. Here’s how it works: You can buy your tickets online or drive to the station and buy your ticket there (they have parking available) . There are tons of stops throughout the city, so if you buy it online, you can just pick up the trolley at the stop nearest you — no car needed. Once you’re on, the driver gives you a narrated tour along the way to each stop. You can hop off and back on at as many stops as you like throughout the day. If I remember correctly, it runs every 15 minutes, so you don’t have to wait long for the next trolley. At the time I’m writing this, their operating hours are 9 am – 4:30 pm, and the cost per ticket is $25. Pretty much every activity I list in this guide is a stop along the trolley tour. Well worth it! Note: It isn’t actually a trolley car; it’s like a covered open-air shuttle. The Gonzalez-Alvarez house is thought to be the oldest house in St. Augustine, dating back to 1723. It’s now operated as a museum and offers a really interesting tour of the house, grounds, and additional structures. The tour was about 20-30 minutes, and really interesting and informative. After the tour, you’re allowed to walk around and explore the grounds more on your own. Our tour guide was super knowledgeable. She did a great job of painting a picture of what it would have been like living there in the 1700 and 1800’s. 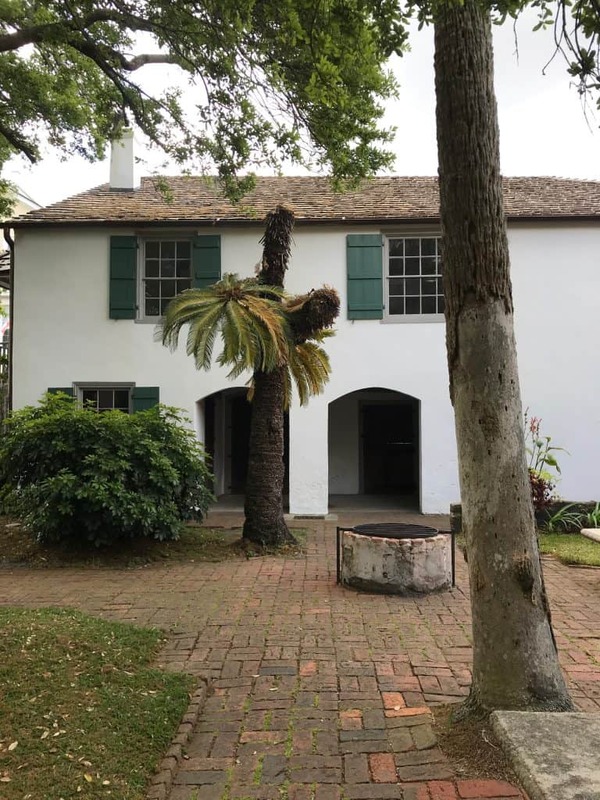 The original structure of the oldest house in St. Augustine, plus a 400 year old palm tree! As someone who loves history and old houses, I loved getting to tour and learn about this historic home and the people who lived there over the years. This is a quick and easy outing, and in my opinion, one not to be missed if you’re at all interested in St. Augustine history. It was probably my favorite excursion of the whole trip! Note: If you stay at the St. Francis Inn like we did, you’re only about a block away from the Oldest House (and they offer a 50% discount for inn guests!). I wasn’t about to come to the oldest city in the country and not go on a ghost tour! With St. Augustine’s extensive (and unfortunately very violent) history, ghost sightings here are common. And because of this, there are also many ghost tours to choose from. With a recommendation from our innkeeper, we decided on the Afterlife Tour. 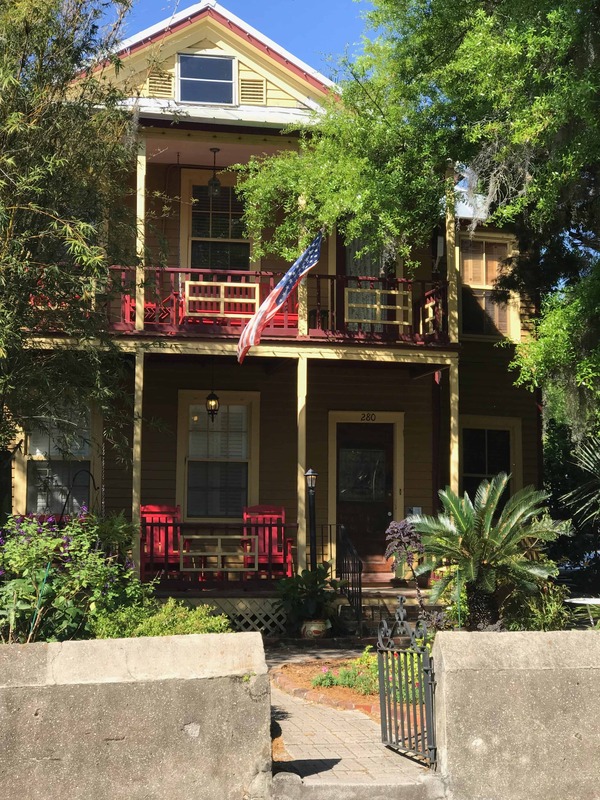 These folks are actually legit paranormal researchers who have done extensive research in St. Augustine (including at the St. Francis Inn where we stayed!). I liked that they actually research all the sites on the tour, both the historical records and conducting paranormal research on site. At each site, the guide told us about the sighings/hauntings that have been observed there, the history of the site, and then played EVP recordings and /or videos of what they’ve recorded when conducting research there. It seriously gave me chills a few times. He also debunked some of the urban legends that are told in the area and on a lot of the other ghost tours (we actually passed other tours and heard some of them being shared). The tour lasts about an hour and a half and is a walking tour around Old Town. 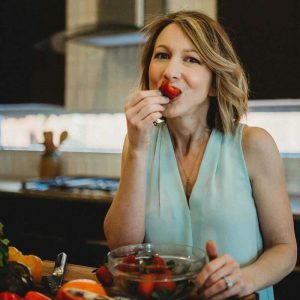 Being a wellness coach, I always try to add in a wellness component to my travels, and especially if I can find something unique to the area or that I’ve never tried before. 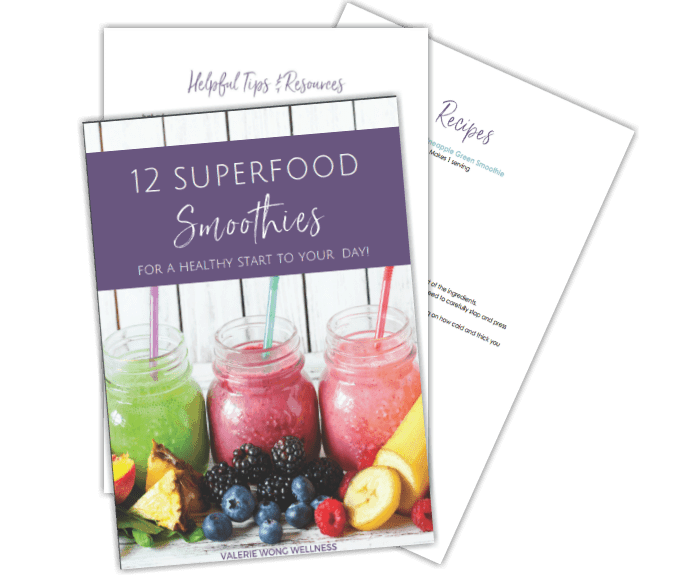 It’s like a mini wellness adventure! That’s what led us to The Salt Spa of St. Augustine. The Salt Spa offers salt cave therapy, infrared sauna therapy, and float tank therapy. Now I LOVE a dry sauna (one day I WILL have one in my house! ), but I wanted to do something different that I’ve never tried. The float tank sounded interesting, but honestly I didn’t want to get my hair wet and deal with washing and drying it again. So we went with the salt cave therapy. A little background . . . I’d never heard of a salt spa, but apparently they’re quite common in Europe and becoming more common in the U.S. Salt cave therapy has been used in Eastern Europe for hundreds of years, and, aside from being relaxing, it’s said to have lots of health benefits, particularly for respiratory issues (but the list of ailments it’s supposed to help is pretty long). 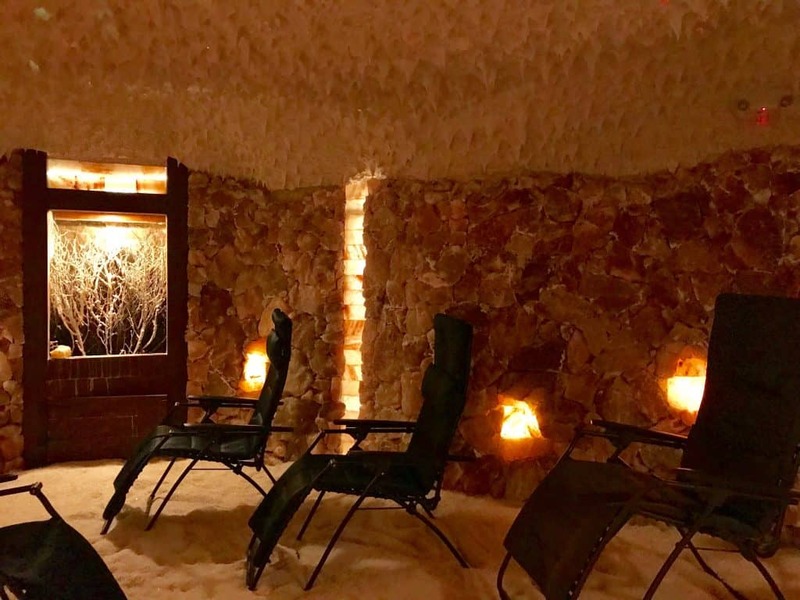 The owners of the Salt Spa in St. Augustine are Polish, and wanted to bring the longstanding tradition of salt cave therapy in Poland to the U.S. They’ve imported over 25 tons of therapeutic salt from Poland and the Himalayas! When you arrive at the spa, you check in, take off your shoes and put on slippers (you stay dressed in your street clothes), and then they bring you into the salt cave. It’s a medium sized room with walls made completely of salt and a thick layer of Himalayan salt covering the floor. It’s a beautiful setting with soft lighting, relaxing music, and pretty colored lights embedded in the ceiling. You sit in an anti-gravity chair, relaxing and breathing in the therapeutic salt air. The salt cave at The Salt Spa – so relaxing! For some reason I was expecting the salt cave to be warm, like a sauna, but it was actually really cool in there (I’ve since learned they keep it at a constant 69 degrees F). They give you a blanket to cover up in case you get cold. There are multiple chairs in the cave, but my mom and I were the only people in there during our session, which lasted for 45 minutes. While I doubt we experienced many health benefits from only one session, it was really peaceful and relaxing. We both fell asleep and felt rested and relaxed at the end. If you’re looking for a little respite during your stay in St. Augustine, I recommend the salt cave therapy at The Salt Spa. It’s also very affordable at just $33 for a session (much less expensive than a massage!). We were here in spring when it wasn’t hot, but on a hot summer day, I think the cool and cozy atmosphere of the salt cave would be a nice break from the heat and an especially refreshing mini retreat from your sightseeing. Castillo de San Marcos — I wish I’d gotten better pictures because mine don’t do it justice! Castillo de San Marcos is a fort built by the Spanish over 315 years ago. We learned that it’s the oldest masonry fort in the United States and the oldest structure in St. Augustine. This fort is pretty amazing and definitely worth a visit and the entrance fee. It was quite a sight to see and honestly I can’t imagine coming to St. Augustine and not touring it. The history is so interesting and it’s in incredible condition because of the unique local stone it’s made from. Plus, the views from the top are really nice and if you pay attention, there’s a good chance you’ll see dolphins swimming below — we saw a lot of them! You probably know that St. Augustine is the site where Ponce de Leon discovered what he considered to be the fountain of youth. At this park, you can see the actual fountain and even take a drink from it. And yes, we did drink from the Fountain of Youth — just in case! But there’s a lot more to the park than just the fountain.The grounds here are beautiful and it’s set up to be sort of a living history, with people in costume telling you how people lived back when the Spaniards arrived, and the history of this site. 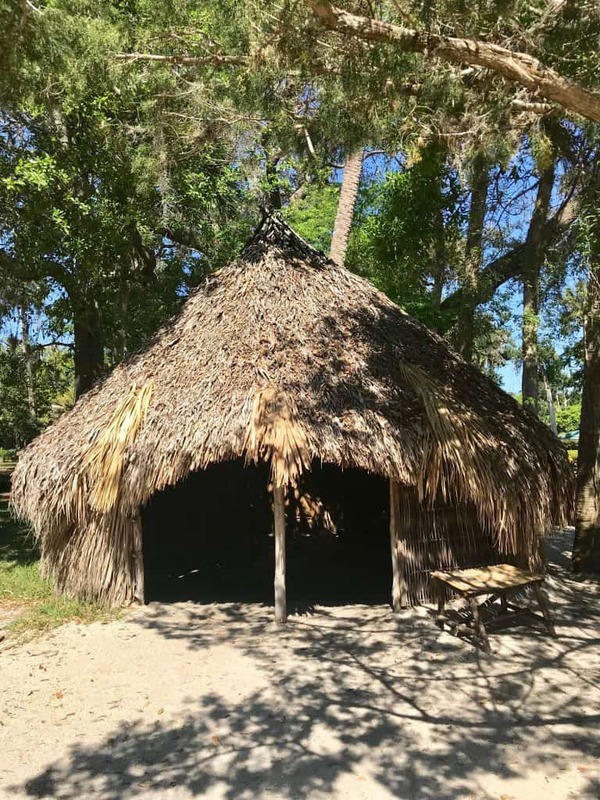 A reproduction of the Timucuan tribe’s thatched roof house — it kept you cool in summer and warm in winter! There were photos on display from the archaeological dig where they excavated the burials of many Timucuan Indians buried there. 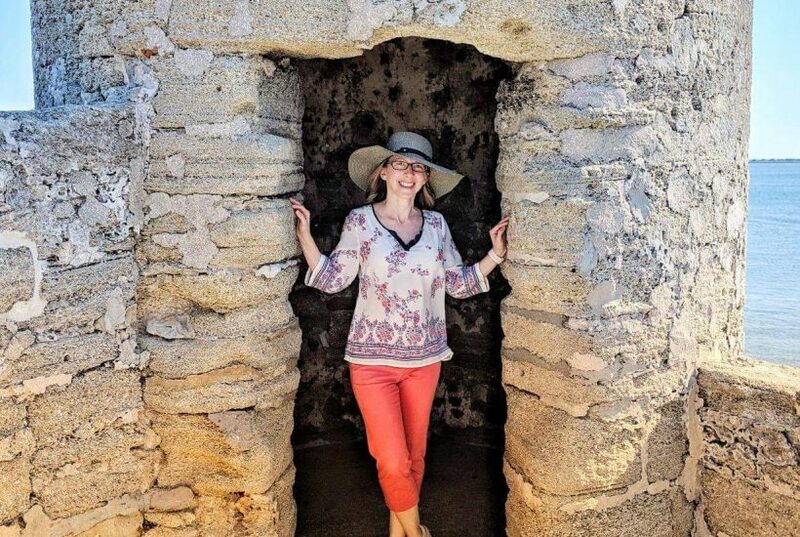 We learned more about the Timucuan culture and you could go inside a reproduction of a thatched house in the style they built (which were really impressive — they actually stay warm in the winter and cool in the summer). I especially enjoyed learning about the indigenous Timucuan Indians. Unfortunately, it’s a sad tale that has repeated itself too many times — the indigenous people here helped the Spaniards when they arrived, but then were killed off by Europeans either by way of diseases to which they had no immunity, or warfare. Definitely a black spot in our nation’s history. From what I gather, no Timucuan people remain, so I’m glad this park is there to help tell their story so they aren’t forgotten. They also have several shows, like a firearms show and others, but we didn’t go to any of those. While the park is probably geared a little more toward kids and families, it was interesting and we’re glad we went. You definitely want to take a stroll down St. George Street while you’re in St Augustine. This is the main street that runs through the Old Town historic district. A large portion of it is closed off to vehicles, and you can walk through the street and peruse all the shops, attractions, and restaurants. We didn’t spend a lot of time here, but if we’d had more time I would have loved to do more exploring of this area. We’re not big shoppers, but I did see some cute things in some of the boutique shops, and I bought some really yummy fudge at Whetstone Chocolates. The one attraction we did visit on St. George Street is the Oldest Wooden School House. It’s right on the main street and is a quick tour that’s only $5. As a kid, I loved Little House on the Prairie and read the entire Laura Ingalls Wilder series. I still have all my Little House books! So for me, this brought back memories of the little wooden school house that Laura Ingalls attended (at least it’s what I imagine it would have looked like, even though it’s from an earlier time period). This school house was built in the late 1700’s and is the original structure. It’s pretty amazing that this little wooden building has survived hurricanes, wars, and natural decay for all these years. There’s also a really pretty garden you can walk through. Granted, the talking exhibit inside the school house is kind of hokey and definitely geared to young children, but it was neat to see the house and gardens and worth the $5 admission if you’re already on St. George St. (but I wouldn’t make a special trip just for the school house — unless you’re just REALLY into old school houses). 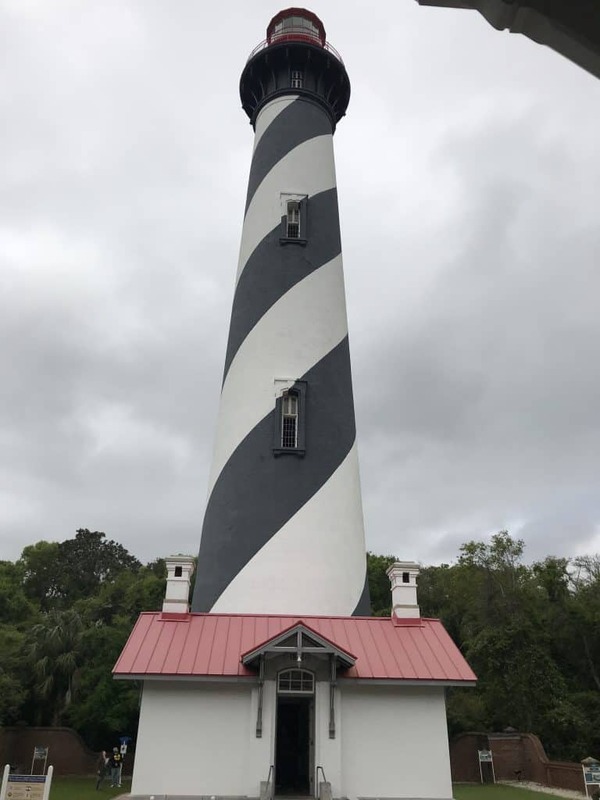 We toured the lighthouse on our last day in St. Augustine, which turned out to be wet, windy, and really cold! So we didn’t get to take full advantage of everything this excursion offers, but we still really enjoyed it. 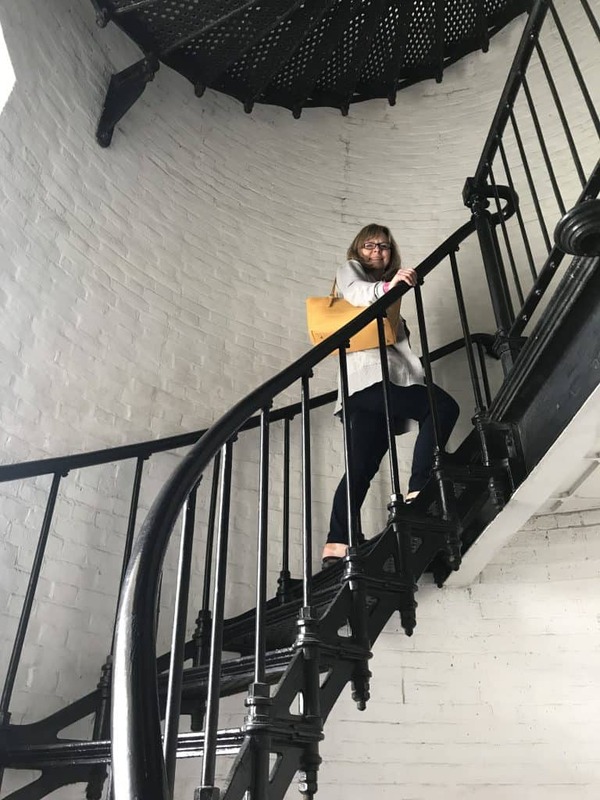 I’m happy to say that I met the height requirement to climb the stairs inside the lighthouse 🙂 (#shortgirlproblems) and that we did climb all 200+ steps to the top. Along the way we were lapped several times by a woman probably in her 70’s who said she walks up and down the staircase 8 times each day. Talk about an inspiration — time to up our fitness game so I can be in that good a shape when I reach my 70’s! We didn’t get to go out on the observation deck at the top due to the 37mph wind gusts, but we did get to take a peek out the door at the top to an awesome view of the city, plus we got nice views along the way through the windows on each level. In addition to the lighthouse, there’s the Keepers’ House. This was also interesting with some nice exhibits, including an exhibit with artifacts from a shipwreck (they’re all the way down in the basement, so don’t miss them!). There’s a behind-the-scenes tour that’s included with your admission (which we didn’t take advantage of because of time) and they have beautiful grounds with some nice natural surface trails. I would have loved to walk the trails, but it was just too cold. Next time! Because we had a delicious breakfast at the inn every morning, there are only lunch and dinner reviews/recommendations here. But, I hear The Bunnery on St. George Street is a great breakfast stop. We arrived in St. Augustine on Sunday in time for Sunday brunch, which we had at The Reef. What’s nice about this restaurant is it’s right on the ocean.We sat on the covered deck and had an awesome ocean view while eating (it was literally the only time we saw the ocean during this trip!). Also they had relaxing live guitar music, which was a nice touch. The ocean view from The Reef Restaurant — this is closest I got to the beach the entire trip! The Sunday brunch is a buffet for $39/person. Now we love a good buffet, so we were pretty excited. Unfortunately, this wasn’t a very good buffet. I will say the crab legs and boiled shrimp were good, and so were the waffles, but the rest of the food was sub-par. Especially the biscuits, which were cold, hard, and dry. It’s kind of a tourist trap, so don’t fall for it! My caveat to that would be if you want to go with the plan of just eating $39 worth of crab legs and shrimp, which is what I did, then it’s probably worth it! Just don’t go with the idea that it’s gonna be a buffet where you’ll have a variety of good food to choose from, because it’s not. Despite my opinion of it, this is a really popular restaurant and it was hopping on Sunday, so I recommend reservations. We had dinner at Preserved, which is a farm-to-table restaurant whose chef is a James Beard nominee. 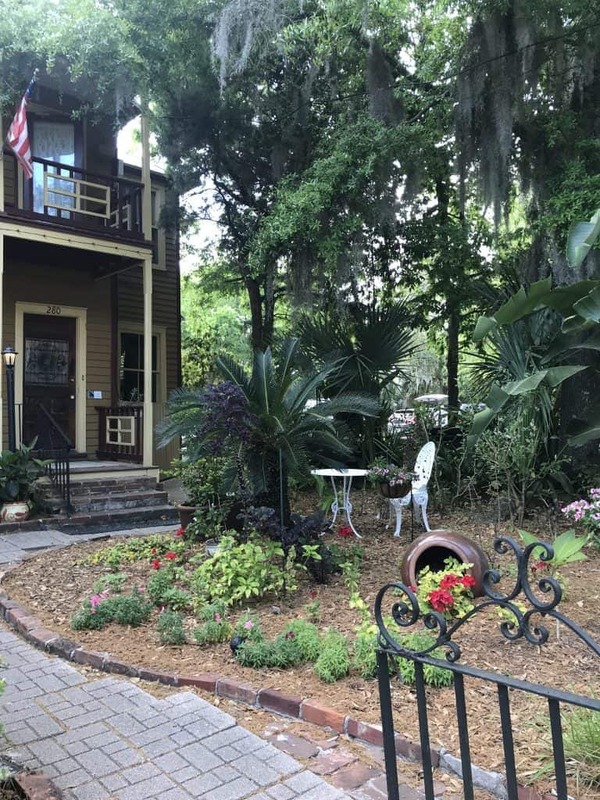 It’s in a beautiful old house with a wrap-around porch in the historic Lincolnville District. It’s super cute and charming. We loved eating outside on the porch at Preserved — so charming and relaxing! We were seated on the porch, which was so lovely. It was surrounded by trees and a little herb garden, and was nice and quiet with relaxing jazz playing. Inside the restaurant it was a bit more noisy and kind of dark. It also felt a little more formal. Unless that sounds like your cup of tea, I recommend sitting on the porch, which was bright, casual, and relaxing. I had the Black Hog Farms Chicken, which was a seared breast, black eyed peas, leg and thigh meat, Swiss chard, pearl onions, roasted grape tomatoes, thyme, and poultry jus. It was delicious. I debated between that and the Mayport Shrimp and Grits, but I really wanted all the veggies that came with the chicken. I thoroughly enjoyed this dish. The Black Hog Farms Chicken — so good! Unfortunately, my mom didn’t have as good an experience. She ordered the Steak Frites, which was supposed to be prepared medium rare at the chef’s recommendation, but came out medium well. Our server was great and quickly took it back to have it replaced, but by the time the replacement came out I had finished my dinner (and I’m a really slow eater! ), and she only had about 15 minutes to eat before we had to leave for our ghost tour. I feel like this was an isolated incident for this restaurant and not the norm, but maybe just play it safe and don’t order the steak there. They took care of us and comped her meal for the trouble, without being asked, so I give them props for that. Aside from that, I loved this restaurant and would definitely go back. I’m all about farm-to-table, and it also had a lovely atmosphere, delicious food, and really excellent service. Food-wise, it was my second favorite meal in St. Augustine, and atmosphere-wise, it was my favorite. If you’re into farm-to-table dining, too, I definitely recommend coming here while you’re in St. Augustine. Note: This is on the outskirts of Old Town, but still walkable. But if you’re not walking, they have off-street parking available. We had lunch at Cafe Alcazar and really enjoyed both the food and the atmosphere. The cafe is part of the Lightner Museum complex and housed in a late 1800’s historic building that used to be the Alcazar Hotel. It’s a beautiful and elegant setting — and unique, as you’re literally sitting in what used to be the swimming pool of the hotel! In fact, at the time it was the largest indoor saltwater pool in the country. 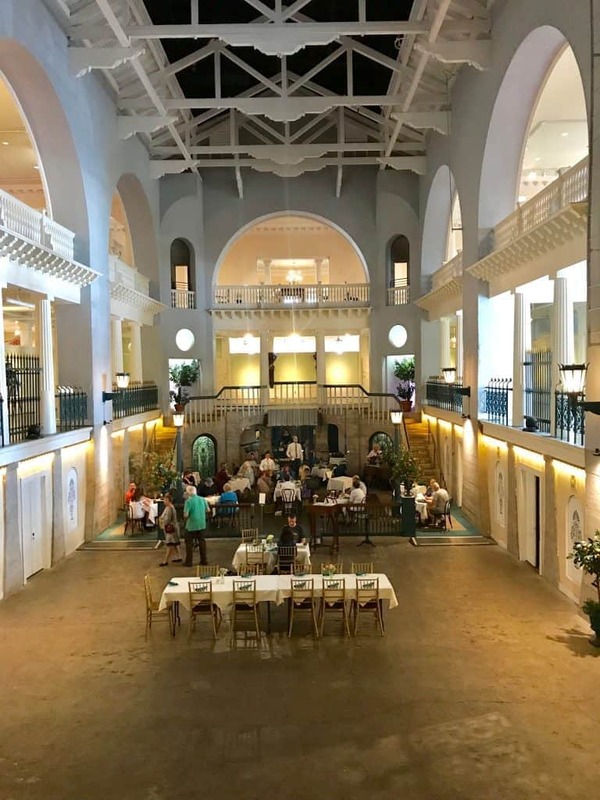 Lunch at Cafe Alcazar — the walls of the dining room were originally the walls of the country’s largest indoor saltwater pool! The food, mostly sandwiches, salads, and pastas, was very tasty and made from local and organic ingredients. There was relaxing live guitar music playing (I’m wondering if it was the same musician from The Reef?! ), which added a nice touch. We thoroughly enjoyed our lunch here. It’s a great choice if you want a nice lunch in a quiet and unique setting that feels a little more upscale. The chicken salad from Cafe Alcazar — light and tasty! Note: Cafe Alcazar is only open for lunch, with hours of 11-3 seven days a week. We got lucky and were seated easily without a reservation, but their website HIGHLY recommends making a reservation, especially between October – March. This place gets rave reviews, and overall I’d say it lived up to the hype. 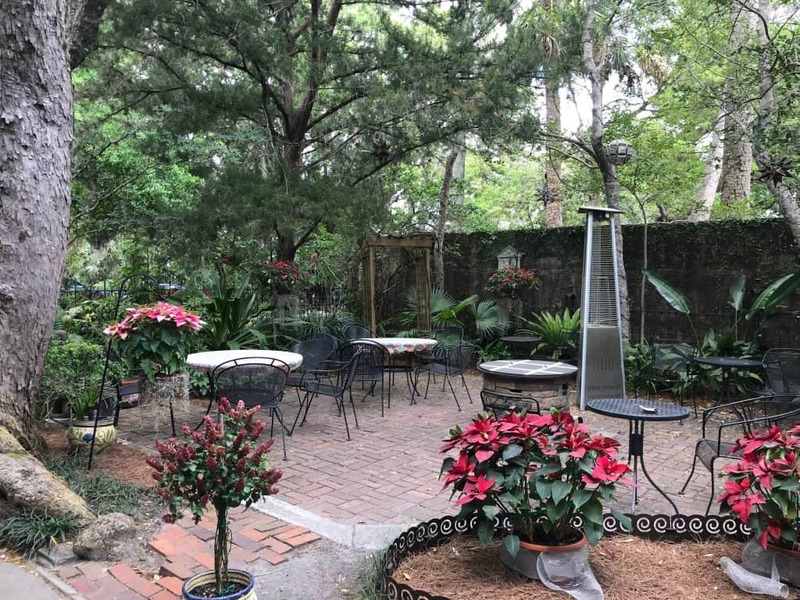 It’s located in the Old Town area across from the historic Tolomato Cemetery, so it’s easy to get to and puts you in close proximity to basically everything Old Town has to offer. And if you happen to be driving, they even have off-street parking. 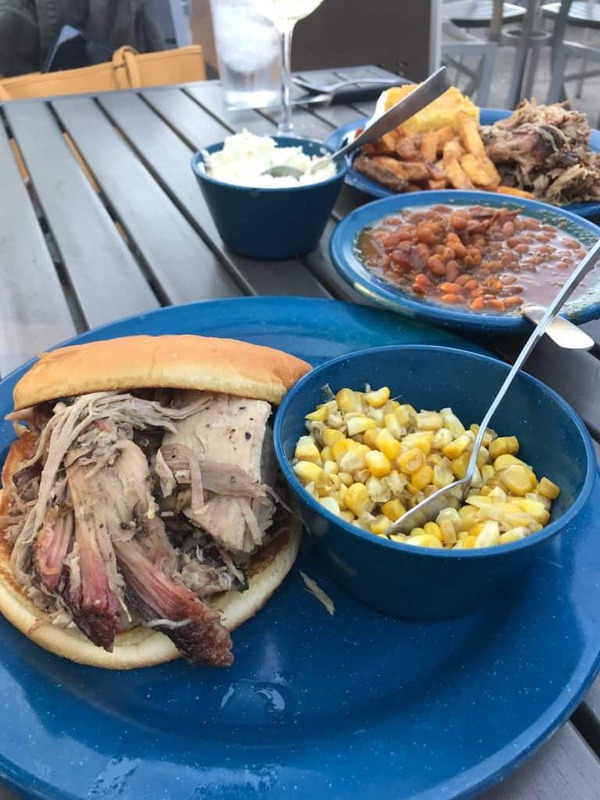 I rarely eat pork, but being a Georgia girl, I do love some good pulled pork BBQ (just like my mom). So, eating BBQ is a rare treat for me that I only indulge in about once or twice a year and I’m really picky about where I go. I’m happy to say that MOJO did not disappoint. The meat was really tender and juicy with a good flavor that you could enhance with one of four sauces (sweet, chipotle, Carolina vinegar, or mojo – and maybe there was one more??). For me, it’s all about the sauce! I went with the sweet sauce (loved it), and I think Mom did a combo of the sweet and the mojo sauces, which she really liked. The sides were good (not amazing, but solid), and they have really good Southern sweet tea. If you’re from the South, then you know this means their tea is good and sweet. We sat outside on the patio, which was really nice. The service was terrific, too. If you’ve got a hankering for BBQ while you’re in St. Augustine, MOJO is a great choice. This was my most disappointing meal of the entire trip. Prohibition Kitchen is a bar and eatery on St. George St. Mom and I stopped here for lunch the day we did the Old Town Trolley Tour. We weren’t sure where we’d end up around lunchtime, so we hadn’t planned out our lunch in advance (which always spells trouble). So we winged it and went here because we were hungry and it was the first place we came to on St. George St. that didn’t have a wait. Well, that should have told us something. I mean, the food wasn’t awful, but it was mediocre at best. We each had a cup of lentil soup (which was actually surprisingly good), and we shared the chicken sandwich, which was bland and disappointing. I will say the atmosphere and decor were cool and they had a huge beer selection. I think the only reason to come here would be for the bar and the beer selection. Otherwise, don’t waste your time on Prohibition Kitchen. There are much better places to eat! This was my favorite meal in St. Augustine. Catch 27 is located in Old Town. 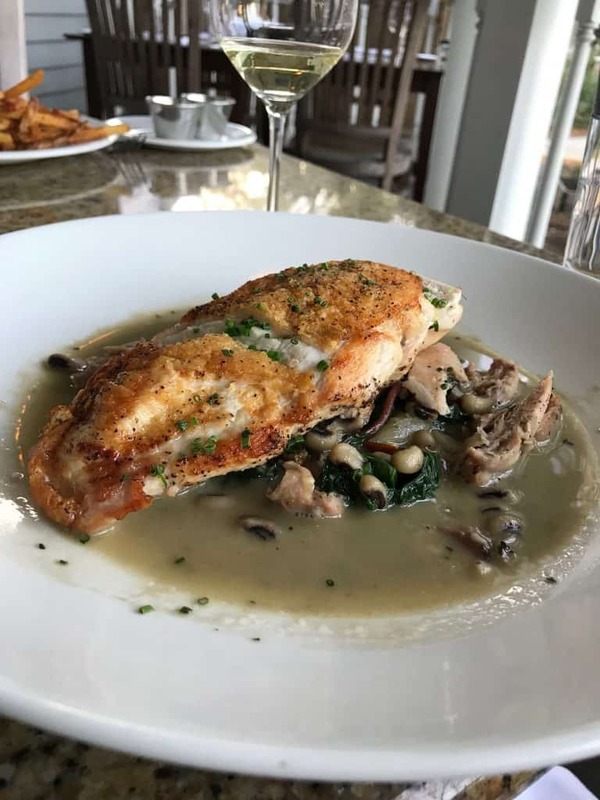 They cook everything from scratch with seasonal ingredients and local produce, and their fish, shrimp, and clams are caught in Florida waters and delivered fresh every day. It’s a great choice if you’re looking for fresh seafood or fish (that isn’t grouper — which seems to be the only fish most restaurants offer here, and it’s very over-fished and not a sustainable choice, so I never order it). This is a cute but tiny restaurant with limited seating. Even early on a Tuesday night there was a wait with no reservation. They have a really nice patio area in the back, which is where we sat. Even though it was chilly that evening, they had plenty of heaters to make it pretty comfortable. I love eating outdoors and this patio was terrific with several big trees for and lights for atmosphere. The service was excellent, the menu had a nice selection, and my meal was delicious. I had the grits and shrimp with a side salad. The salad was simple but just so good (I don’t remember the last time I got so excited over a salad). The grits & shrimp had a really nice flavor. They were very generous with the shrimp, which was perfectly prepared. The grit cakes were delicious and the collards that came with it had a smokey and slightly sweet flavor that was well balanced and delicious. It was a unique spin on traditional shrimp and grits and I loved it. If you like good fish and seafood, I highly recommend coming here. Notes: (1) Make reservations! (2) Parking is non-existent here, unless you get super lucky and find a spot on the street (I drove around for 10 minutes without finding one, so don’t count on it). There are paid lots for $15, but that’s such a waste of money. I would recommend walking or trying to Uber here if at all possible. We drove because my mom’s foot was acting up, and then I literally drove my car back to the inn when I couldn’t find parking and walked back to the restaurant. Luckily, it’s an easy walk if you’re in Old Town. Sigh . . . this was our last meal in St. Augustine before heading home, Luckily, it was a good one! Salt Life is actually on Anastasia Island. After visiting the lighthouse, we decided to eat somewhere on the island before heading for home. Since we hadn’t planned to do this, we were winging it again and relying on reviews and intuition to guide us. The two places that seemed to have the most good reviews on Anastasia were Salt Life and Sunset Grille. Side note — We went to Sunset Grille first and were so unimpressed by the atmosphere, unwelcoming and disinterested service from our server, and the menu that we paid for our sweet tea, left, and went to Salt Life. I am SO glad we did. I’m not sure why Sunset Grille has all those good reviews. Granted, we didn’t try the food, but the atmosphere was so dated and dark and uninviting, and the service so unimpressive, that we just couldn’t eat there. Okay, back to Salt Life, which actually exceeded my expectations. Aside from not having very good sweet tea, everything was excellent. It has a nice bright atmosphere, with lots of windows and sunlight coming in. On a pretty day (when it wasn’t freezing like the day we were there), it would be really nice to eat outside on their upstairs deck. Our server was so friendly and helpful, knowledgeable about the food, and very patient with our barrage of questions. 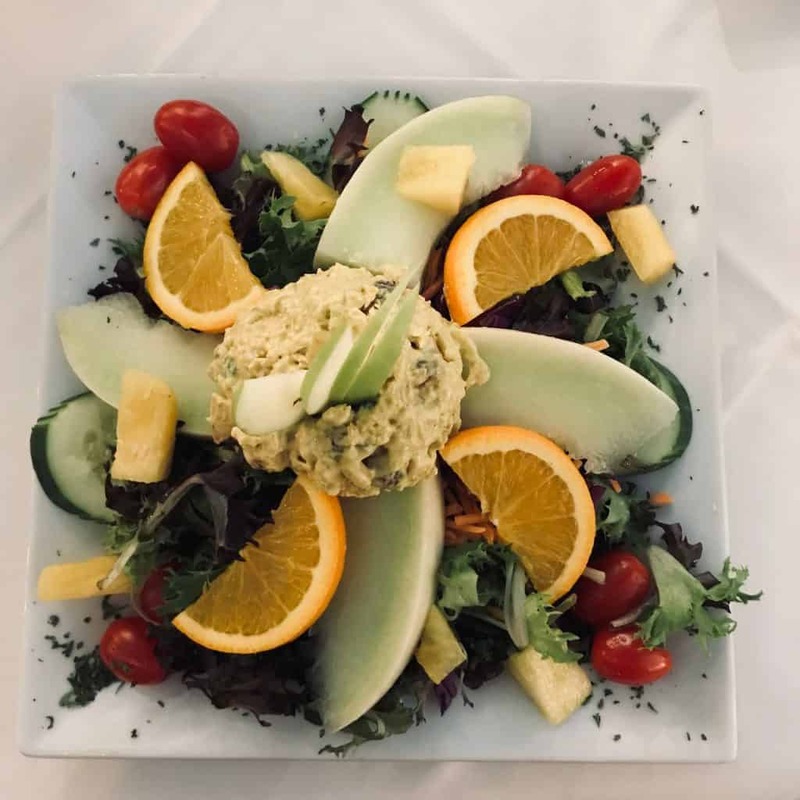 Their menu has a wide selection, including salads, sandwiches, raw bar, sushi, tacos, appetizers, seafood, and selections for non-seafood eaters. They even offer a gluten-free menu. I had the Beach Boil, which is essentially a low country boil. It was so good! Mom had the Rainforest Shack Fish (with the catch of the day, mahi mahi). She really liked it and said it was her favorite meal of the trip. I tasted it and thought it was very tasty. And it came with some perfectly prepared sweet plantains, which luckily I was able to swap some of my beach boil sausage for. Otherwise I would have had to ask for a separate order of them because they were that good. 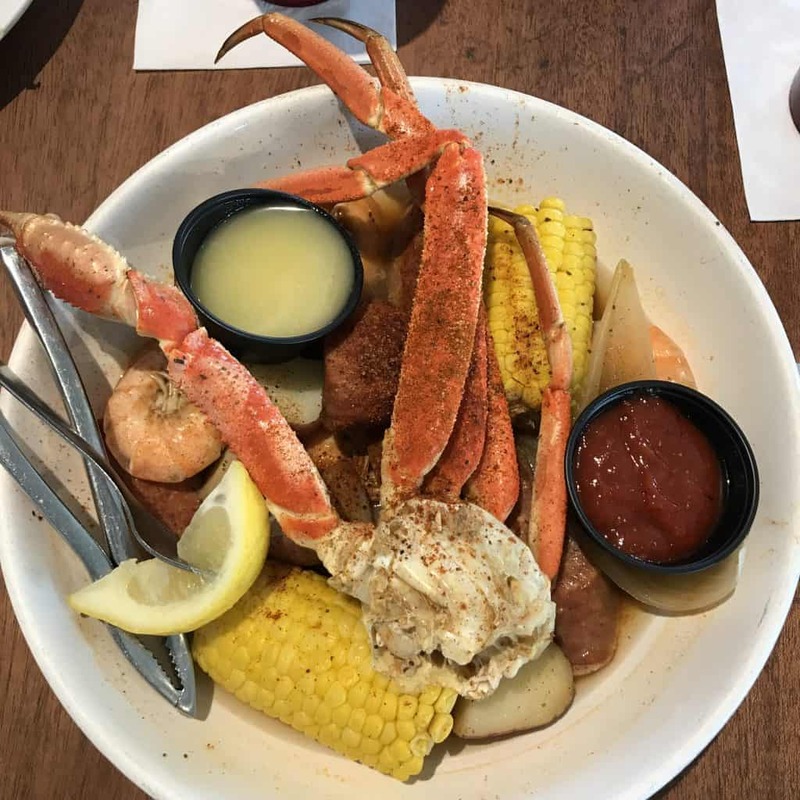 The Beach Boil at Salt Life Food Shack — ask for extra napkins! 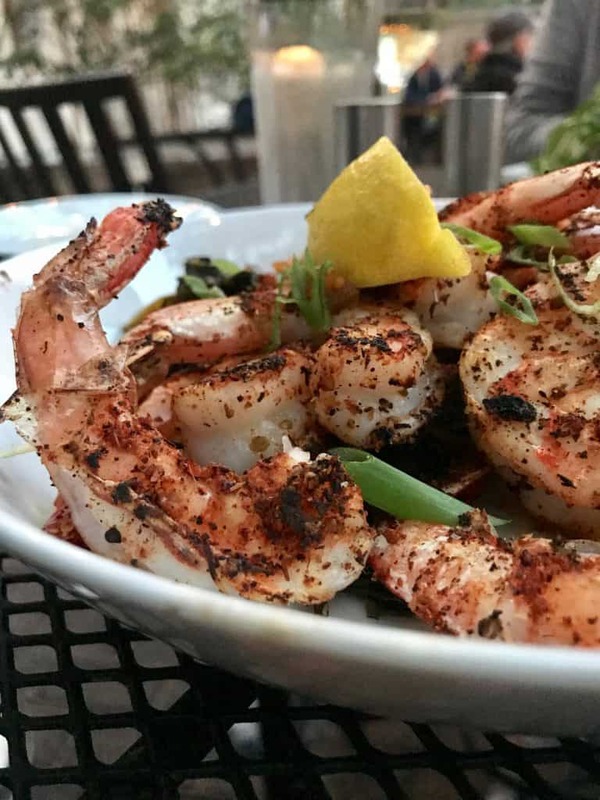 Salt Life Food Shack is a fun casual spot with really good food and service — definitely worth driving over the Bridge of Lions for! Or do like us and combine it with a trip to the lighthouse (hopefully on a warmer day than we had!). We loved our time in St. Augustine. It’s a beautiful city with so much to do and a fascinating history. I wish we’d had more time to explore all the places, attractions, restaurants, and natural habitats we missed. I guess that means I’ll just have to go back! Have you been to St. Augustine? I’d love to know your favorite restaurants, inns, and things to do — please comment below!